Original poster: a rare instance of the poster exactly matching the tone of the picture it advertises. 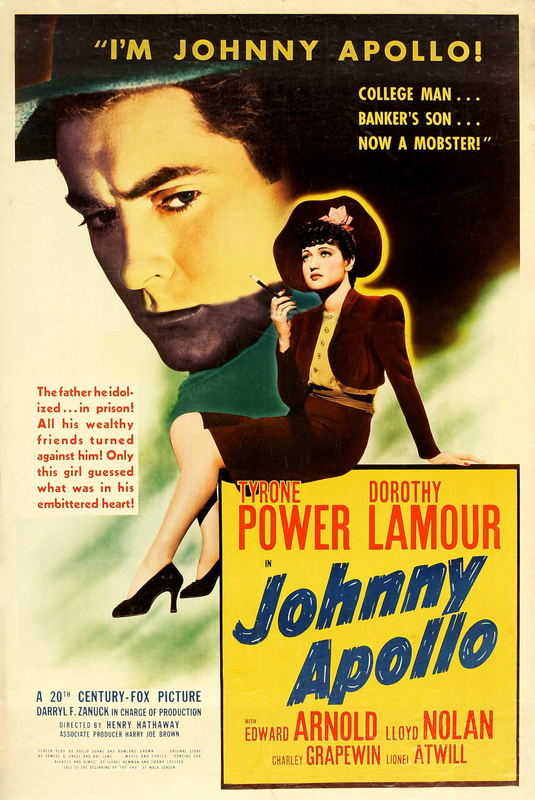 Although there are plenty of gangsters and criminal pursuits in “Johnny Apollo” (Twentieth Century-Fox, 1940) it is a Papa Drama first, a Love Story second, and a Gangster Picture third. When the story opens, Wall Street tycoon Robert Cain Sr (Edward Arnold) has just been indicted for embezzlement. For Cain, it means scandal, disgrace, ruin and a stretch in the pen; for his son (Tyrone Power), it means paying for his father’s sins and a descent into a life of crime. You can read a more complete overview of the plot by clicking here. This scene should give you a good sense of the overall tone of the picture. As Lucky DuBarry, actress/saloon singer and part-time chippie, Dorothy Lamour lays on the tough girl stuff with a heavy hand, but for this picture, I think that’s a virtue. Her lack of subtlety and shrewdness makes Lucky increasingly poignant as the picture progresses. I’m particularly fond of the scoring in this scene, with “Melancholy Baby” being played on a cheerfully rinky-dink honky tonk piano. I also like the way that the two characters, both of whom have loved ones cooling their heels in jail, play the scene looking at each other from behind bars. On first viewing, I felt that Lamour was working too earnestly at the hard-bitten shtick. On further reflection, however, I think it’s not Lamour, but Lucky, who is trying too hard to be tough, and she overdoes it because she’s not terribly bright. In fact, she’s a bit of a lunkhead. She’s only got two settings: hard-boiled and half-baked. When she’s irritated, she puts on her tough girl act; when she’s sentimental, she gets sloppy and dreamy-eyed. But mainly, Lucky’s too sensitive for her own good and she needs the tough girl pose to protect herself. The problem is she’s not clever enough to fool anyone. That’s what makes her poignant. For instance, she says “Hey, look: get a load of the robin!” with an emphatically snotty tone of voice, as if she finds the innocence of nature something to sneer at. But immediately after she says it, she closes her eyes tight and crosses her fingers like a little girl. “Yer supposed ta make a wish.” The point is, she really is making a wish because she’s superstitious. Dope that she is, she overplays the baloney-on-wry patter, then undermines it by being overtly sentimental. Who knows how much thought Lamour did or didn’t put into this? Frankly, it doesn’t matter: all I care about is that it works. I find her enormously touching. Lucky’s lament — “That’s why I’m starvin’ ta death in a mink coat that I wouldn’t dare sell!” — tells her entire story in a single line. She never lets up on the world-weary downward inflections, and she looks with disapproving boredom at the world with her eyelids at half-mast, but you can tell that she’s got a good heart and is hungry for affection. And she’s got a little yen for this handsome sap, which is going to grow into something serious. For now, she’s in charge, because she’s not yet in love. There’s a sentimental cliché about lawyers in pictures that goes back to the earliest days of the talkies and maybe into the silents: the attorneys we’re supposed to like are usually drunks. I have no idea why the cliché continues to this day: I’ve worked in and around law firms for almost thirty years, and in all that time, I’ve never known a single attorney who was a loveable sot, or even an unloveable one. 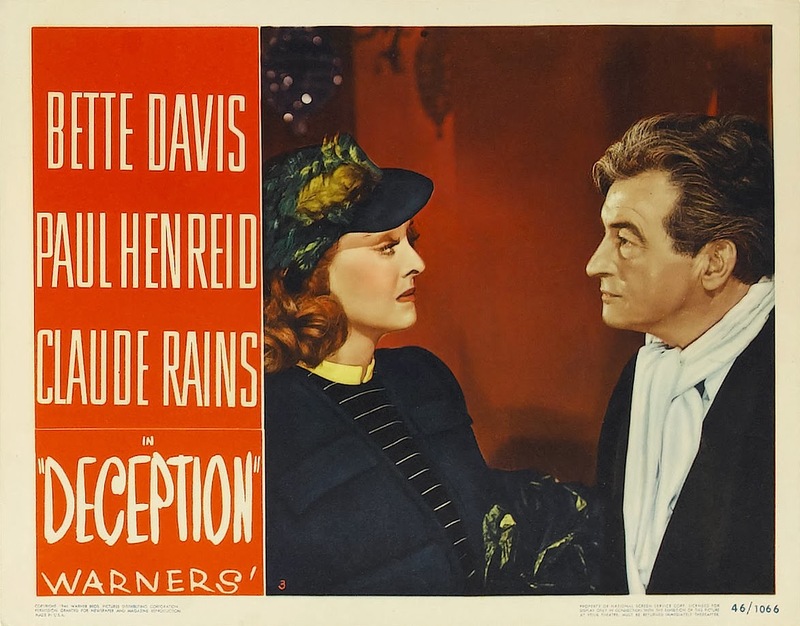 Anyhow, the drunken shyster in this one is played by Charley Grapewin, and he’s terrific. How I wish there were truth in this Hollywood fiction: I’d like it if this sort of soak were indeed a regular fixture in the legal profession. I’d like to hear a tosspot declaiming Latin poetry and Victorian bombast after returning from a liquid lunch. The awful circle of our solemn church! I launch the curse of Rome! I love the way Dorothy Lamour sings this torchy tune by Mack Gordon, and I like the arrangement. This tune comes about halfway into the picture and casts a romantic haze over much of the rest of the action that follows it. The lighting is also gorgeous: notice how cinematographer Arthur C. Miller has lighted Lamour and Power so that there’s a seam of silver running along their jawlines. They’re both extremely attractive people, but Miller makes them look like gods. Lamour looks like a woman in love: her eyes never leave the man she loves, and you can tell that she’s no longer confident in his presence. Meanwhile, with his father still in the bighouse making boilers, our hero keeps getting sucked deeper and deeper into gangland activities. He spends a lot of time at Mickey Dwyer’s Paradise Club, where he watches Lucky perform ratty numbers like this one. The tune (by Lionel Newman) and lyrics (by Frank Loesser) are lively and fun, but my God, how terrible that dance routine is! The girls are actually pretty good, but the steps are so vulgar, awkward and undignified that one gets the impression that the girls are to blame; the uncredited choreographer has gone out of his way to make them look like lousy hoofers. I wouldn’t have it any other way: for once, a picture features a dance number of the low quality one would expect to find at a low dive like the Paradise. If just about any other actress in the world played this scene, it would be camp. But this is where Lamour’s straight-ahead, no-frills performance really wins the day. She doesn’t go in for any tricks; she doesn’t try to play more than exactly what the lines say. She speaks every line with complete conviction. Bette Davis would probably play too many angles; Barbara Stanwyck would be too intelligent and strong to be entirely sympathetic. But Lamour talks tough because that’s the language she knows, but even while she uses snappy streetwise patter, she’s completely guileless. And old Charley Grapewin has beautiful chemistry with her. “Well, anybody that plays ball in your league has got to play a pretty fair brand of ball.” It’s probably the nicest thing anyone ever said to her, and you can see from the way the tears shine in her eyes how much the compliment means to her. The underscoring is “This Is the Beginning of the End,” and if the orchestration is more than a little woozy and soppy, so are the characters in the scene, and it’s the sort of music they respond to. I don’t deny that it’s all fairly crummy and obvious, but I love it. The material may be second rate, but you can see that the actors’ hearts are in it and they play it for all they’re worth. I find the scene irresistible. The first time I saw “Johnny Apollo,” it was the afternoon feature on a local New York television station. I came upon it near the end, just about five or ten minutes before this next scene. I was well acquainted with Edward Arnold as a turbulent gasbag from the Capra pictures — sort of a poor-man’s Adolph Menjou (both were born on February 19, 1890) — but this was my introduction to Dorothy Lamour. (I’ve always been allergic to the Road pictures.) The way she handles herself in this scene made a positive and lasting impression on me. She also speaks what continues to be my favorite line in the picture. A few hours after I saw the end of “Johnny Apollo,” I had to be at a rehearsal for a show. As luck would have it, an opportunity arose for me to reply to somebody’s question with “As far as twenty bucks and a mink coat’ll take me.” Another cast member, who was two years my senior, immensely wealthy, incredibly glamorous and impossibly out of reach, had also seen “Johnny Apollo” that afternoon, and loved it. He was bursting to talk to somebody about it, but none of his friends had seen it. So, as has often happened in my life, simply by quoting a line of dialogue that had struck a chord, I stumbled into what became an important friendship. He was by far the greater connoisseur of this sort of movie, and his enthusiasm for B pictures with smart-aleck dialogue was the beginning of my love of trashy pictures. I remember we both took the line as an arrant bit of Hollywood camp. Yes, it is camp, but because Lamour speaks it with complete sincerity, I find that it’s much better and more satisfying than mere camp. And for me, it was the beginning of a beautiful friendship, which was cut short: he died young, in the first wave of the AIDS epidemic, and now I cannot see “Johnny Apollo” without thinking of him. I make no doubt, the very idea that “Johnny Apollo” would summon up the memory of him years after he had shuffled off this mortal coil would have made him roar with laughter. This entry was posted in Main and tagged Arthur C. Miller, Audrey Hepburn, Barbara Stanwyck, Bette Davis, Cary Grant, Charade, Charley Grapewin, Dame Edith Evans, Dancing for Nickels and Dimes, Darryl F. Zanuck, Dorothy Lamour, Edward Arnold, Edward Bulwer-Lytton, Edwin Booth, Frank Loesser, George Arliss, Horace, John Gielgud, Johnny Apollo, Lee Strasberg, Lionel Atwill, Lionel Newman, Mack Gordon, Melancholy Baby, Richelieu, This Is the Beginning of the End, Tyrone Power, William Shakespeare on May 20, 2015 by TR.